You can watch a documentary, or read a book, but nothing beats learning by doing it yourself. Hands-on discovery is an essential aspect of scientific study and should be part of every science lesson. And you don’t need expensive equipment or complicated ingredients to get started. 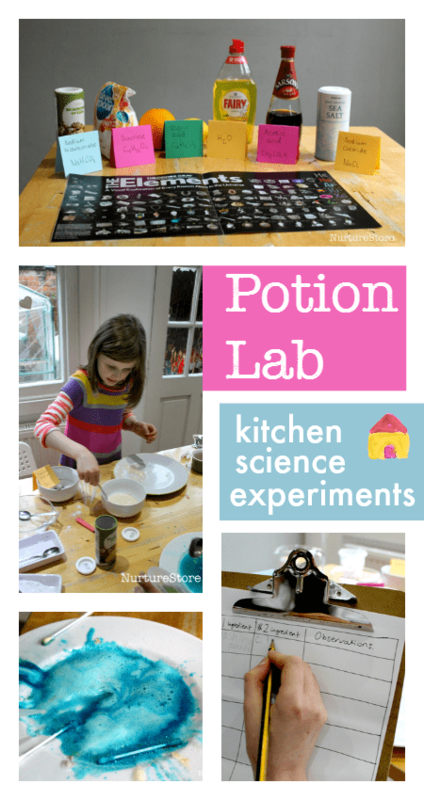 This potion lab is one of those easy kitchen science experiments you can do at home, or in a classroom, promoting lots of questions, observations and learning. 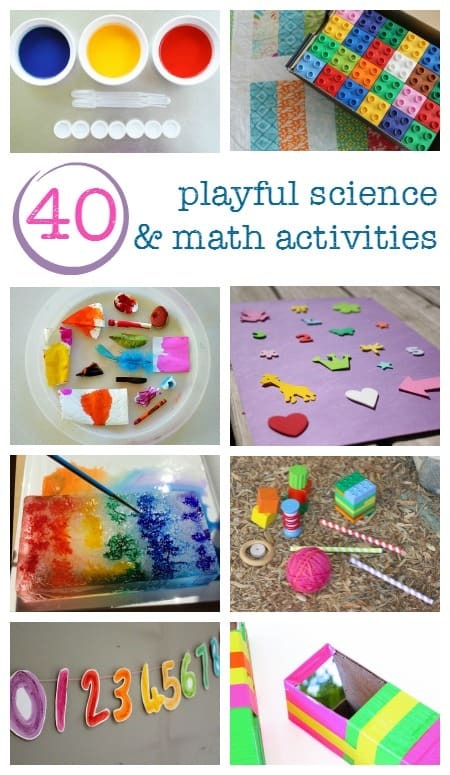 Tip: If you’re looking for a great resource full of creative, hands-on math and science, take a look at our Fizz, Pop, Bang: Playful Science and Math ideas. 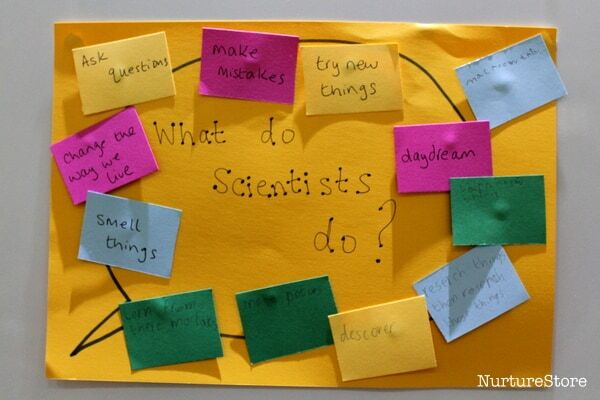 To promote an atmosphere where we all feel encouraged to participate, we started off our morning with a quick chat about ‘What do scientists do?’ I want the children to know they are scientists, and that not knowing the answer, asking questions, trying things out… is all part of what real scientists do. A Scientist isn’t someone super clever, who knows all the answers – a scientist is you and me, looking and discovering. The Elements: A Visual Exploration of Every Known Atom in the Universe by Theodore Gray. This visual book takes you step by step through the Period Table. We found all the pictures really sparked our interest. You can’t help but flick through the book, have your attention caught by something that looks amazing, and then you’re into the reading and learning things you never knew. It’s great for younger children, even those pre-reading, and had enough information in it for my older daughter too (age 12) to be a good introduction. Our edition comes with a pull-out poster, which you can see in the photo above, and which we have been using as a quick reference to our study. You can get the book from Amazon (affiliate link – NurtureStore gets commission for purchases via this link). The TED Ed videos of The Periodic Table are a wonderful resource to dip into and we found them a good accompaniment to The Elements book. There’s a short video for each element – with a good number of explosions! – along with additional supporting material if you want to dive in deeper. 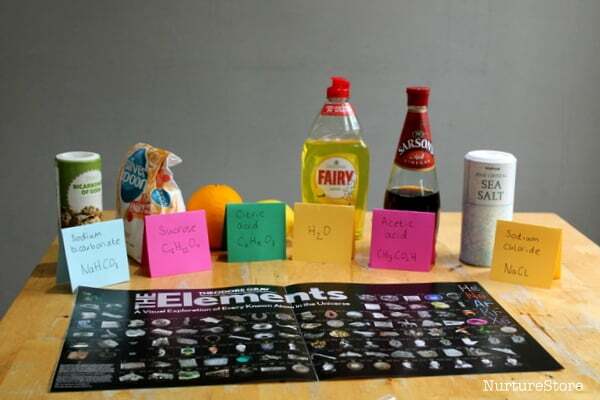 Once we’d spent a few days working our way through the period table resources, the children were familiar with some names of the elements and chemicals, and their scientific names. To introduce our potion lab I prepared a set of cards with the names of some of the chemicals we were going to use in our potion lab. I didn’t tell the children their common names, but I did say we would find everything we needed in our kitchen. 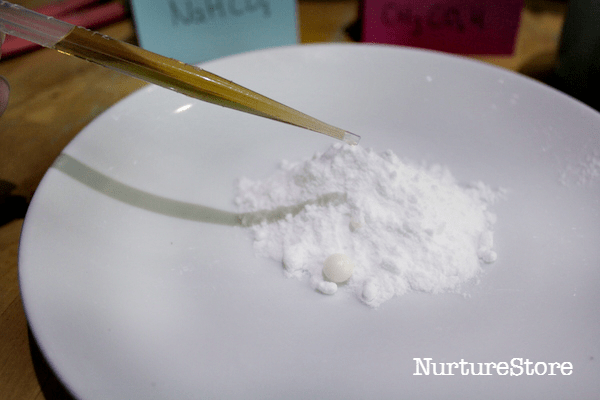 After having seen all the footage from the science lab in the TED videos, and seeing all the explosions, they were amazed that we would have these chemicals in our house. 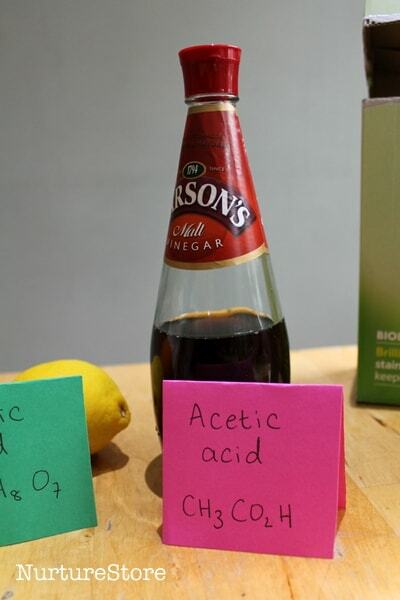 So, it was a good reveal when they found out we’d be using sugar, lemon juice, vinegar, water, bicarb of soda and salt. And we added washing up liquid, washing power, and some food colouring into the lab too. 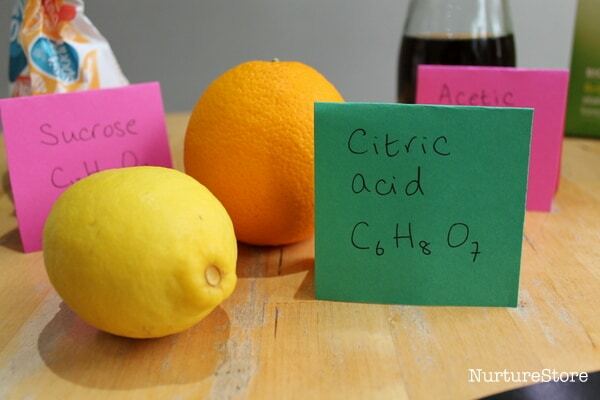 We matched up all the ingredients with their chemical names and found that ‘chemicals’ doesn’t necessarily mean artificial, or harmful, or dangerous. 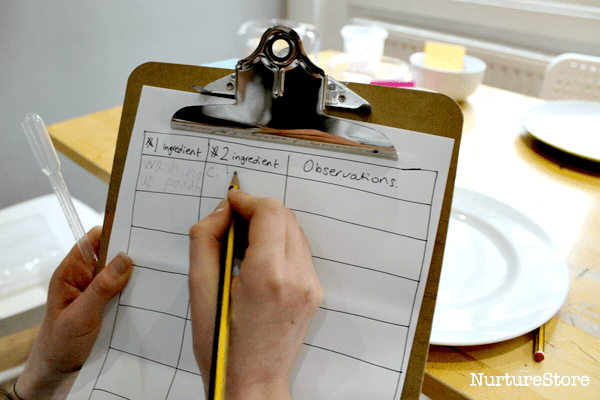 To record our potion lab experiments we use a simple chart, where we could list the different ingredients we were combining, and note down our observations about what we saw and smelt. I encouraged the children to design their own experiments, choosing which substances to combine. But I did tell them that there was one combination that would give them a good fizz! They enjoyed the freedom to lead the potion lab themselves, and there was a lot of chat about which ones to pick and how much of each ingredient to use. 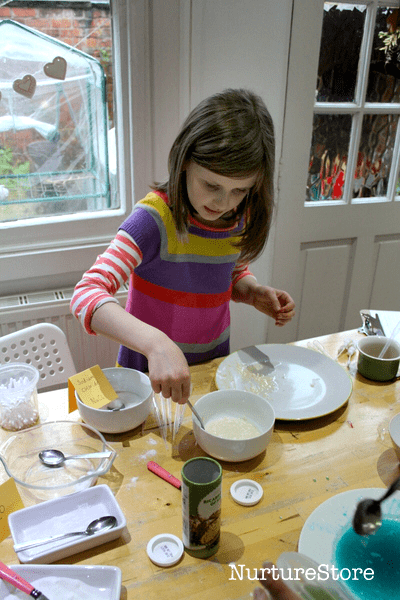 They measured carefully using teaspoons and pipettes, and swapped findings with each other – which then generated new ideas for new combinations. These plastic pipettes are great for science experiments (and art, when filled with paints or water). You can buy packs of them online at Amazon (affiliate link – NurtureStore gets commission for purchases via this link). And they did find that fabulous, fizzy combination. 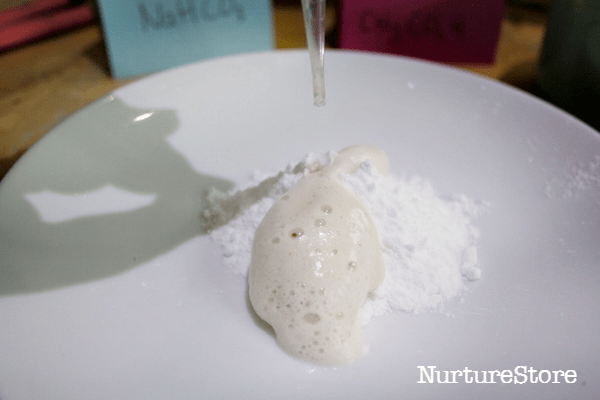 Some NaHCO3…..
with some CH3CO2H dropped on top. 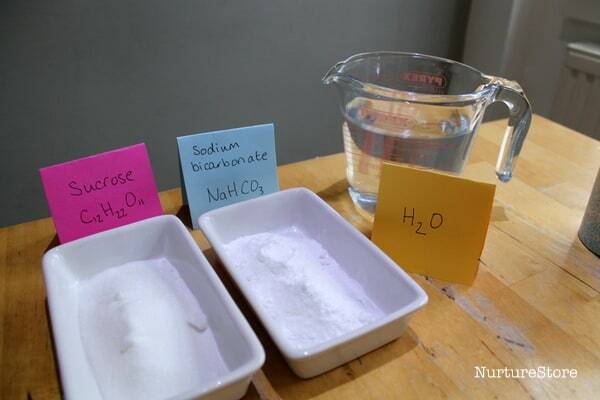 That’s bicarbonate of soda with vinegar of course. Even prettier with some food colouring added in! You can find more ideas for creative, hands-on math and science in our Fizz, Pop, Bang! resources, including a balloon that doesn’t pop, gorgeously colourful ice experiments and some great engineering projects. Come and take a look! Very, Very COOL!!! I can’t wait to use this with my children and students!! !